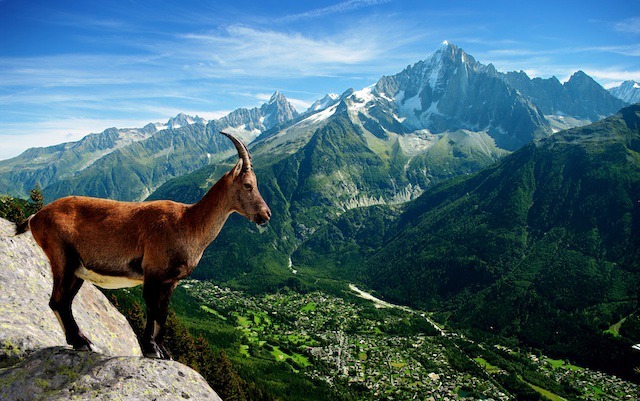 Of the larger animals you’re most likely to see Ibex, as they’re not shy creatures and are often seen on or above the paths, particularly on the Stage 10 from Tre Le Champ to La Flegere. While they are quite used to walkers it’s best not to get too close to a wild animal with horns, so keep a respectful distance and use your Camera’s zoom! The Alpine ibex is a mountain goat that can be easily identified by the male’s large scimitar-shaped horns which have ridged lines on the front. Ibex are related to domestic goats and will mate with other goats if unable to find a mate in the wild. Females have smaller, thinner horns which develop more slowly than the male ibex. In the early 19th Century the Alpine Ibex were hunted to extinction and it’s estimated that by 1856 only 60 Alpine ibex remained on a royal hunting reserve in the Grand Paradiso region of Italy. From this remnant population an effort was made to reintoduce them to the rest of the alps which has been successful with protection. 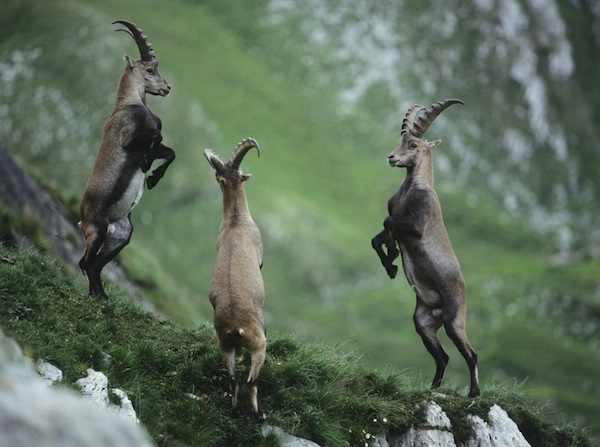 It’s now thought that there are over 40,000 ibex in the Swiss Alps alone! Easily confused with the ibex the chamois is a rarer and smaller goat-like animal found at moderately high elevations throughout the Alps. Chamois were once greatly prized for their coast and also excessively hunted and many people in the Chamonix area were Chamois hunters. They are agile climbers and if they sense a threat they can ascend 1000 meters in about 15 minutes. Chamois are easily recognized by their white facial markings and the brown stripe the runs along their backbone. They are being introduced into New Zealand’s South Island now! The Alpine Marmot (Marmota marmota) is common in the Swiss Alps between 2500 and 10,000 feet in elevation. They are excellent diggers, able to burrow through soil that even a pickaxe would have difficulty with. The marmot is the largest member of the squirrel family. The body mass is lightest in the spring, weighing about 6-7 pounds. By the fall they weigh between 12-18 pounds as they prepare for hibernation. Marmots live in an underground burrow or “hotel”. The burrow only hosts one family, but are often enlarged by the next generation. They can create very complex burrows over time. Each alpine marmot will live in a group that consists of several burrows, and which has a dominant breeding pair. One can often see an alpine marmot “standing” while they keep a look-out for potential predators or other dangers. Warnings are given, by emitting a series of loud whistles, after which members of the colony may be seen running for cover. Alpine marmots eat plants such as grasses and herbs, as well as grain, insects, spiders and worms. Marmots spend up to nine months per year in hibernation. 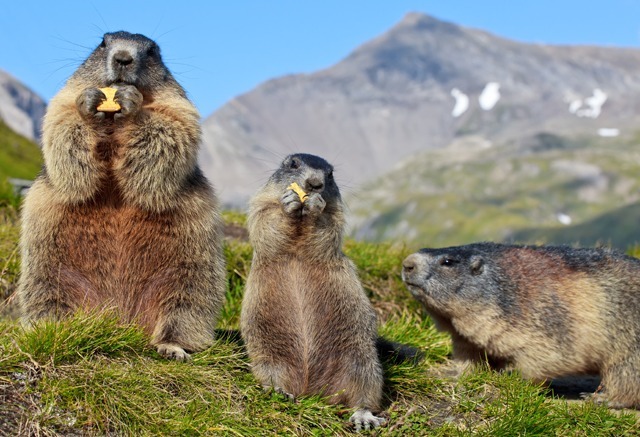 The mating season for alpine marmots occurs in the spring, right after their hibernation period comes to a close, which gives their offspring the highest possible chance of surviving the coming winter. Alpine marmots are able to breed once they reach an age of two years and have gestation period of 33–34 days. Each litter consists of between one to seven babies, though this number is usually three. The babies are born blind and will grow dark fur within several days. The weaning period takes a further forty days, during which time the mother will leave the young in the burrow while she searches for food. If kept in captivity, alpine marmots can live up to 15–18 years. The Montane zone is the lowest of the three characterised by a mixed broadly woodland animal pastures At 1200m this gives way to Sub Alpine zone, dominated by Pine forests. The Alpine zone begins above the tree line and this varies from 1700m – 2000m. 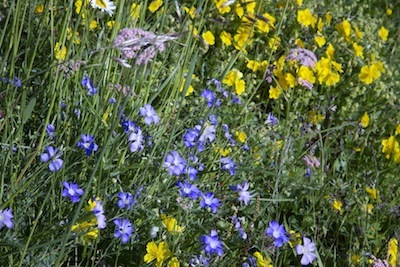 You can find shrubs above the tree line such as Bilberry and dwarf willow and this also where you’ll find the best displays of wildflowers amongst the meadows. Passing upwards into an area where shrubs such as Rhododendron and Myrtle abound, the subalpine level gives way to the alpine level. 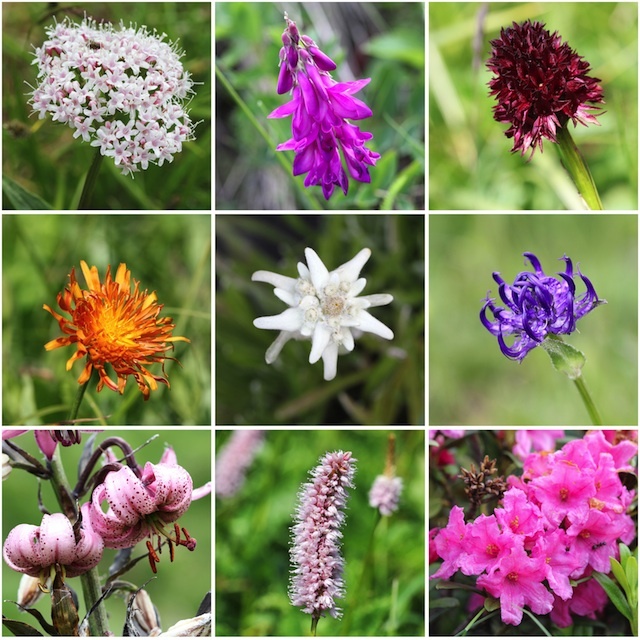 The alpine meadowland is populated by many species with spectacular flowerings on the TMB route, including Gentiana acaule and Gentiana Clusii, the famous Edelweiss and the rare Campanulathyrsoides. 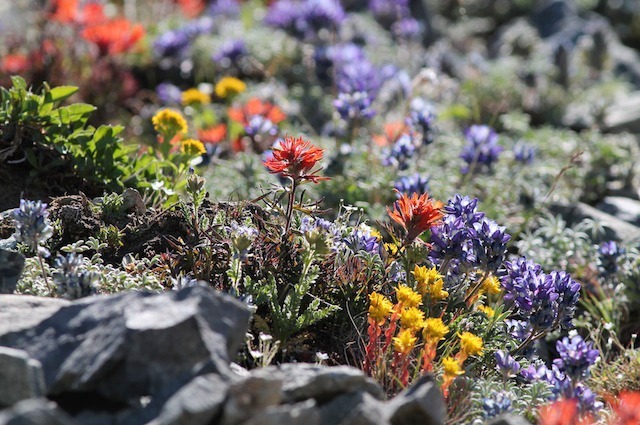 Among the rare plants that can be found in the nival level ( above the perennial snowline), the two that hold the record for height are Ranunculus Glacialis and Saxifraga with two flowers. Sources: Alpenwild, Joint Nature Conservation committee, Rucksack readers Mont Blanc, www.autourdumontblanc.com/flora.